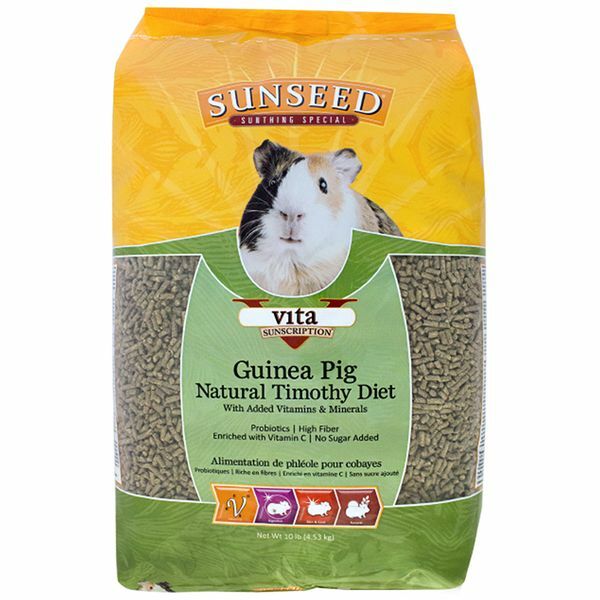 Natural, all-pellet diet made with high-fiber timothy hay and fortified with all the essential nutrients guinea pigs need. 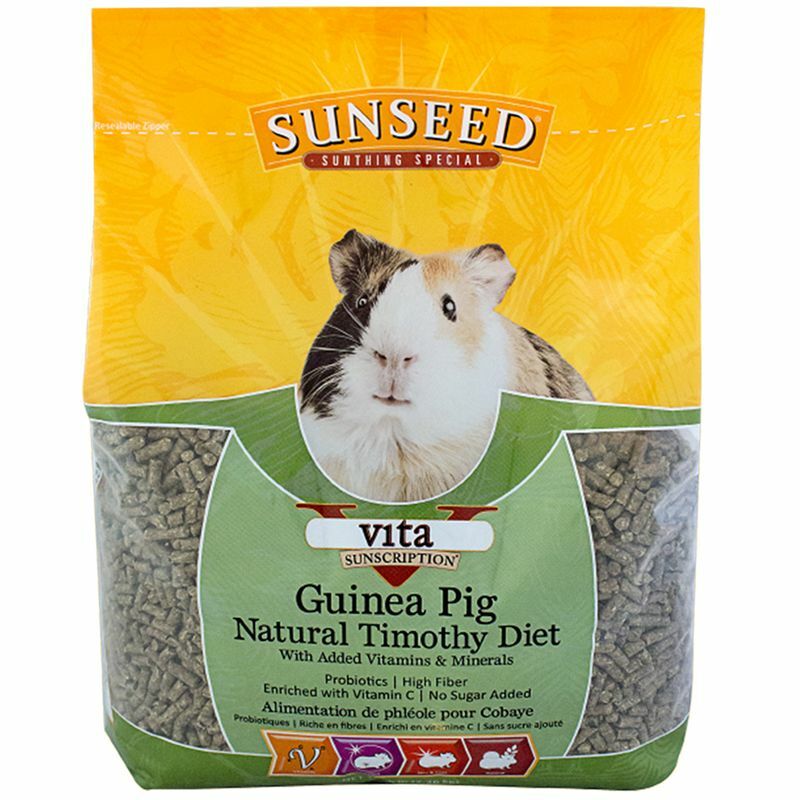 Formulated without added sugars, molasses, or alfalfa hay, Vita Sunscription™ Guinea Pig Natural Timothy Diet is a delicious and nutritional daily food for adult guinea pigs. 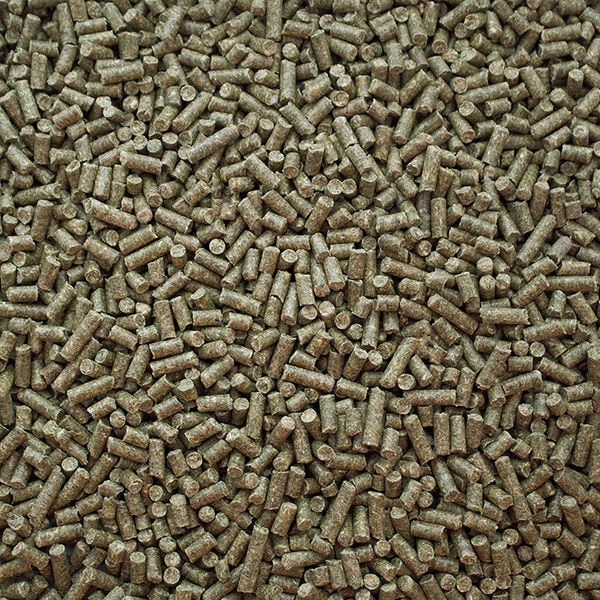 The all-pellet formula prevents selective eating and is a great option for pet parents who would rather provide treats separately from their companion's main food. Offer 1/8 cup to adult guinea pigs (6+ months) daily in a heavy feeding bowl. Fresh, clean water and a high-fiber grass hay should be readily available at all times. Store unused feed sealed in a cool, dry place. For juvenile, pregnant, or lactating guinea pigs, we recommend supplementing this diet with alfalfa hay. When switching diets. start by mixing a little Vita Natural Timothy in with your pet's current food. Over 2-3 weeks, gradually increase the ratio of Vita Natural Timothy every day, until you are filling their bowl with only Vita Natural Timothy. Ground Timothy Grass Hay, Soybean Hulls, Dehulled Soybean Meal, Corn Gluten Meal, Yeast Culture, Salt, Monocalcium Phosphate, Dicalcium Phosphate, L-Ascorbyl-2-Polyphosphate, Calcium Carbonate, Ground Flax Seed, Potassium Sulfate, Magnesium Sulfate, Dried Lactobacillus Acidophilus Fermentation Product, Dried Lactobacillus Casei Fermentation Product, Dried Enterococcus Faecium Fermentation Product, Dried Bifidobacterium Bifidum Fermentation Product, Choline Chloride, Vitamin A Supplement, Vitamin E Supplement, Vitamin D3 Supplement, Yucca Schidigera Extract, Niacin Supplement, Vitamin B12 Supplement, Riboflavin Supplement, d-Calcium Pantothenate, Menadione Sodium Bisulfite Complex, Biotin, Folic Acid, Thiamine Mononitrate, Pyridoxine Hydrochloride, Zinc Sulfate, Zinc Methionine Complex, Manganese Methionine Complex, Copper Lysine Complex, Cobalt Glucoheptonate, Ferrous Sulfate, Manganese Sulfate, Copper Sulfate, Ethylenediamine Dihydroiodide, Cobalt Sulfate, Sodium Selenite. 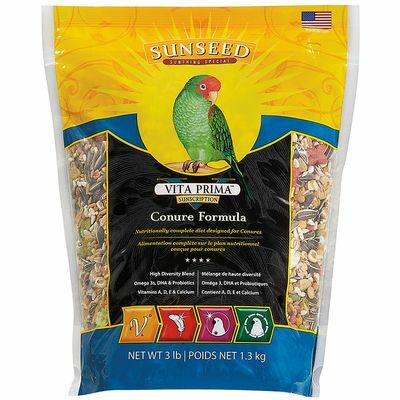 A high-variety blended diet for conures with seeds, grains, vegetables, tropical fruit, and fortified nutrients. 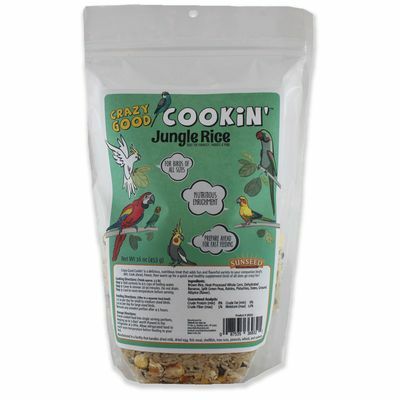 A nutritious, cookable snack for birds featuring delicious jungle-inspired fruits and flavors.